The MS A Baseball team beat Hamden Hall 7-3 on April 10. Rayyan Haider ’24 pitched 3 ⅔ innings, giving up no earned runs and only two hits. In the 3rd inning, Devin Wolff ’23 put KO on the board with a bases-clearing double over the left fielder's head. This gave the Wyverns a 3-2 lead. The team scored four more runs in the 4th, including an RBI single by Brady Nichols ’23, which opened up the game. The was KO’s first game of the season, but they played with mid-season focus and skill. The potent offense was backed by solid defense, with only one error committed. Overall, KO should be proud of starting the season so strong, and the team looks forward to trying for its second win on Saturday against Rumsey Hall. The JV Golf team had their first match at Connecticut National against Rectory on April 3. The two teams played match play on a very windy day. The KO golfers came out of the match winning 5-1. Congratulations are in order for Cole Banning '24 and Lily Liu '22 for playing in their first high school match. The Varsity Girls’ Lacrosse team lost to Suffield Academy on April 6 with a score of 15-9. The team got off to a fast start going up 5-2. Unfortunately, poor play led to turnovers and allowed Suffield to storm back and take a lead. In the waning minutes, while Suffield went into a stall, the Wyverns needed to take chances defensively, which lead to some easy goals as they extended their lead. Nicole Genga '19, Mia Seymour '19, Catherine Daniels '21 each scored three goals. Amelia Levine '20 has an outstanding day in net making 21 saves in the 15-9 loss. The Varsity Girls’ Lacrosse team lost to Taft 3-20 on April 8. The score does not reflect the team’s effort; the defense played very well in settled situations. Unfortunately, poor decisions in the transitional game led to many turnovers and fast break goals as Taft quickly built a lead. In the second half, the defense began to tire as the offense continued to have difficulty holding onto the ball. In the end, Taft won 20-3. Tori Swanson '21 and Molly Jones '20 each scored a goal. Angelina Maselli '20 scored her first varsity goal and played extremely well in her debut at midfield causing several Taft turnovers on the day. Amelia Levine '19 had another outstanding day in net recording 19 saves in the game. The Varsity Softball team won 18-8 against Wilbraham and Monson on April 6. This game had its roller-coaster ups and downs, but the Wyverns found their groove to dig deep in the batter's box and finish the game early with a 10 run mercy rule at 18-8 in the sixth inning, after nine straight runs. The team's batting and baserunning practice over the last few weeks really paid off. Olivia Pear '21 and Mackenzie Caruso '22 led the team in RBIs, each with four, and Pear showed off her hard work on slap hitting to successfully bring in two runs on slaps in both the 2nd and 6th innings. Jocelyn Ram '20 nearly gave the ball a new area code with a ground-rule double to left center in the 4th that brought in another run for the team. With KO up 12-8 in the 6th and bases loaded, Brie Toedt '21 solidified the lead by threading the needle with a clutch grounder up the middle for two of her three total RBIs. All around, the Wyverns were swinging the bats and using aggressive but focused base running to cash in on hits and walks. It was the hard work put into the defense that bought the team the time needed to really get the bats going. 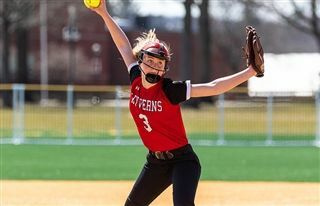 On defense, the Wyverns pulled off two 1-2-3 innings, one of which (the bottom of the 6th) was a clinical, clean-sweep triple strikeout by pitcher Kyra Dunnirvine '23. Throughout the game, Ava Radmanovich '21 was a living, breathing brick wall at shortstop, stopping hard-hit grounders on either side and following up with quick, precise throws to earn the team much needed outs at 1st base. Pear and Ram held the corners in the infield and put an end to a few smashed grounders to get the team out of some tough situations. The Varsity Boys’ Tennis team finished in a tie for 3rd place (w/ Deerfield) on April 6 in an elite, eight-team field that included Groton, Lawrenceville, Hotchkiss, Choate, Westminster, Hall High, and Deerfield. Groton won the team title by one point (25 to 24) over Lawrenceville. Max William Kanz ‘22 won the #4 singles draw with a close, straight sets victory over his opponent. Luke Riemann ‘19 finished in 4th place in the #1 singles draw. Adam Na ‘21 made it to the consolation final at #2 singles. Adam Sonntag ‘19 made it to the consolation final of #3 singles. Riemann and Sonntag earned 4th place in the #1 Doubles Draw. Na and Kanz finished in 3rd place in the #2 Doubles Draw. The Varsity Girls' Tennis team defeated Hamden Hall 7-0 in the opening match of the season. Great wins throughout the lineup. Kay Chin '24, Molly Baron '19, Aimee Zheng '22, and Isa Raymond '19 won their singles matches while Sydney Smith '21, Shreeya Chalikonda '21, Izzy Rome '21, Amrita Natarajan '22, Esha Kataria '20, and Jenna Blocher '20 won their doubles matches. It was a good team win.